Finding a memory leak can be impossible without the right tool. JProfiler’s heap walker offers you an intuitive interface to solve both simple and complex memory problems. 5 different views and lots of inspections show different aspects of the current set of objects. Each view provides you with essential insights on the selected objects and lets you switch to different objects sets. Questions like why objects are not garbage collected are answered with a single click of the mouse. JProfiler records data only when you need it. In fact, you can start your application with the JProfiler agent and attach the JProfiler GUI at a later time. When you do not record any data, the overhead is extremely small. That’s what we call on demand profiling. Invariably, there are a lot of things you can adjust in an advanced profiler. JProfiler shows you how your profiling settings will impact performance and offers you templates to quickly select profiling settings for common use cases. 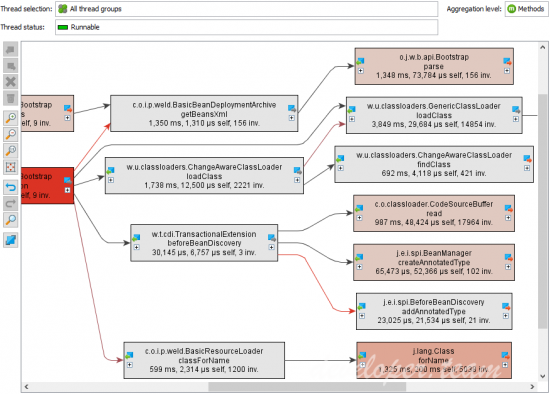 Fixing performance bottlenecks is the most frequent use case for a profiler. However, CPU data can be overwhelming in its level of detail and the way data is collected can make a huge difference in usability. With JProfiler, you have a decisive advantage when trying to find the reason for a problem. Call tree view filters, aggregation levels and thread status selectors are just some examples of JProfiler’s versatility in this area.